Botswana is one of the most fascinating countries to visit for an African safari due to its delta in the desert concept, where the Okavango Delta spreads out across the sands forming a wildlife oasis. Botswana is renowned for its great wilderness areas of Chobe and the Okavango Delta, where life-giving water attracts wildlife in huge numbers but what is not commonly known is that more than eighty percent of the country lies in the Kalahari sands system - and most of this is waterless. With the attraction of water it would be thought that all the animals would be found congregating around the permanent waterways, but this is not so as there are many creatures that survive in the desert. 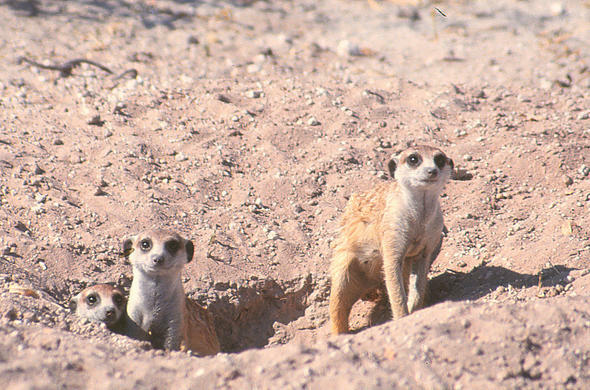 Surviving in arid conditions takes special adaptation and all the animals that are found in the Kalahari have some technique for survival, mostly involving water retention mechanisms. The daytime temperatures can reach up to 45 degrees and with limited shade and no water the denizens of the desert have to find ways of surviving. 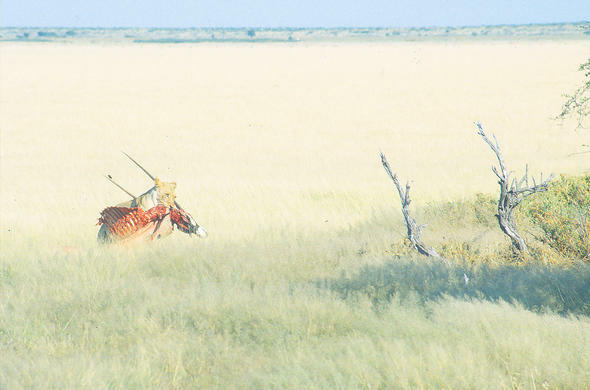 The main issue in an arid eco-system such as the Kalahari is the lack of water and the creatures of the desert have adapted to overcome this in a number of ways. Inspecting the feces of desert animals it will be observed that there is very little moisture in the content and there may be high traces of salt and other minerals which are excess to the needs of the animals. Although it is known that the underground water source is plentiful the plants of the Kalahari have also had to adapt to the harsh environment to preserve water loss. It will be noticed that most plants have leaves with small surface areas and the roots of many of these plants are thick and bulbous to retain water. 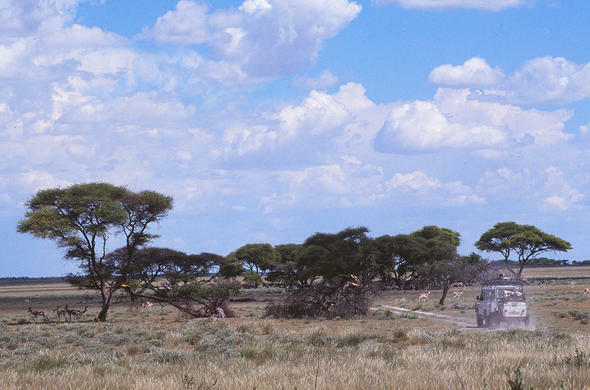 The trees of the Kalahari seldom grow above shrub size, preventing too much surface area being exposed to the sun. 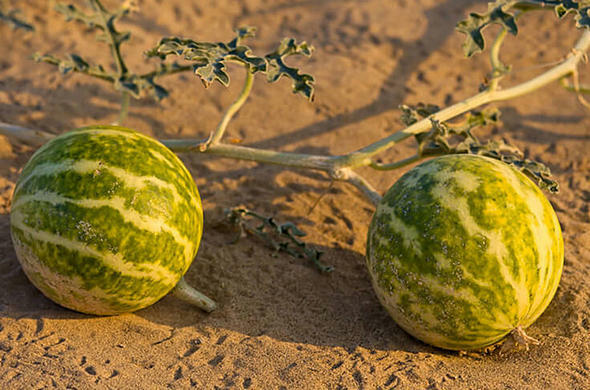 There are a number of plants that produce melon-like fruits that store water and it is these fruits that sustain many of the animals living in the Kalahari. 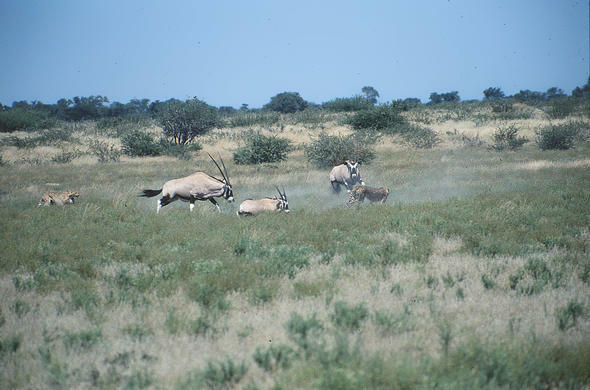 The larger herbivores of the Kalahari such as the springbok and oryx get their water needs from the plants they eat, with their diets consisting of melons and water-rich leaves, but both these species have unique ways of preventing water loss during the heat of the day. The springbok turn the backsides to the sun, showing the white areas on their rumps, thus reflecting much of the heat inducing light and the oryx have a fine system of blood vessels in their nostrils which cools the blood passing through as they breathe. This cooled blood keeps their systems cool, allowing the body temperature to rise as high as the outside temperature. Predators of the Kalahari get most of their water needs from the body liquids of their prey with some predators also known to feed on the fruits of some plants. The Kalahari is not a true desert in the sense of huge expanses of sand as it is vegetated but there is no surface water in the central regions and this is where the animal adaptations are most noticeable.